Following on from some of our other more unusual transport methods - castle and time slip - this month we will be exploring the very important and well known method of getting around, the kettle. It turns out that kettle's aren't necessarily the best way of getting around, even for those that can fit inside! In The Borrowers familiar objects - like kettles - take on an air of possibility and can become the catalyst for adventure. Norton's stories interweave ordinary objects with extraordinary uses. To help bring these stories to life, Borrowers' illustrator, Diana Stanley, perfectly captured the tiniest detail of Norton's miniature world. Here at Seven Stories we have some original illustrations, notes and correspondence in our Diana Stanley collection. Our holdings show Stanley's working process from notes and sketches to tracings. 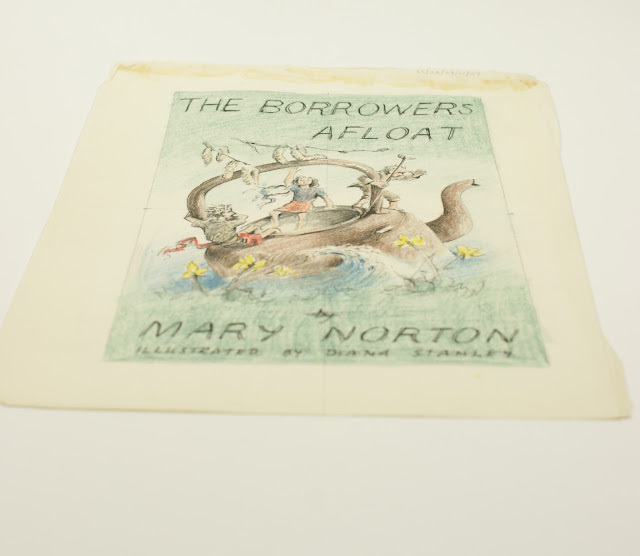 The collection also gives an insight into how Stanley worked with Norton's manuscripts to develop her illustrations. ‘and to cover them another groundsheet above a piece of red blanket. snug in deep protected from rain + dew + invisible from bank. Waterlogged shoe. Laces useful. Between sticks near rusted wire. Stanley's thorough attentiveness to Norton's text is also evident in her sketches; as well as showing development and re-workings of different images the draft sketches include handwritten extracts and notes from the text. For example on one page she writes 'ladder made of matchsticks, neatly glued and spliced to 2 lengths of split cane such as florists use to support potted plants' (From Diana Stanley Collection, DS/02/03/01/08-09). So, what did Mary Norton think of Stanley’s work? Also included in our Diana Stanley collection is a file of correspondence from Mary Norton. In one of these letters Norton refers to the 'ghastly' model village Be[k]onscot in Beaconsfield as '"ersatz" and urban in conception. All for show - and this, poor dears, They will find out after the first flush of seeming luxury' (Mary Norton to Diana Stanley, DS/02/06/03 f.3). Its difficult to be certain with only one side of the correspondence whether these 'poor dears' are the Borrowers, and whether this vision of Bekonscot aligns with 'Little Fordham', the model village the Borrowers have set out to find in The Borrowers Afloat. Though the correspondence is one sided it does give us an interesting insight into Norton’s working process ‘to plough in regardless and get the whole story roughly down, trusting to one’s angel’ (Mary Norton to Diana Stanley, DS/02/06/01 f.2). ‘I could not understand more about that curious feeling of panic an artist always gets before starting work. The whole reason the book is late is due, in my case, to an intense feeling of “stage fright”’ (Mary Norton to Diana Stanley, DS/02/06/01 f.1). Whether stage fright is akin to the fear of being washed away in a kettle I can't say, but a kettle is not to be recommended as a safe mode of transport.